My indoor range, 22"X22"X22" 3/4" plywood behind that a 3/4" mdf board. The inside has 4 pieces of carpet stapled to the back, there are 2 pieces of sloped carpet and 4 shower mats hanging in front of that. I use it for bb's and .177 495fps pellets. All the carpet slows the round down that it just dents the back of the box. Pellets lay between carpet on the back and the carpet that is at a 45 degree slope. I can pick my bb's out and reuse them........... magnets who would have thought a fridge magnet would come in handy for something besides holding junk on the fridge. The targets hang about 2 inches from the shower mats. My range is 30' from muzzle to edge of the box. I like your carpet idea for BBs. My Duct Seal is packed with 10# of lead and I can't imagine how long it will take to pick it all out. Have you ever thought about printing some BR50 targets? It a fun challenge and will put your marksmanship to the test? Only one shot per bull, and the lines are so very close. Its a ton of fun! excellent. I wish I could shoot indoors. but apartments too small. for backing I use my old blue jean legs ; cut off just under the zipper. if you think fridge magnets are good ; try some of these . they are called rare earth magnets. I got 25 off e-bay for about $6.00. they are super strong. if you wan;t more target ideas take a look farther down the page under homemade magnetic target. some of mine and other members target ideas are there. lots of good ideas. Thanks for the info. I priced out the duct seal at home depot, I'd need a lot to fill the box. I got all the carpet and shower mats at dollar store, I love that place. They have some Styrofoam balls they are of different sizes but that will have to wait for spring as i don't want to have to vacuum every time I shoot. My wife is bring home some good magnets from work, they will do as the fridge magnet is a bit small and not much power. I need to get pictures up of mine! Mine's 28' from door frame to backstop. The room is half solid rock that wasn't blasted out to make a complete finished room. I am using Clothes line and pulleys to run the target frame to and fro. Need to get the lighting finished up at the gun end of the room. IT is great when the weather is too cold or night or too damn rainy! And besides that, the rough aesthetic makes it totally uninteresting to the resident "interior designer." Might be worth double-checking the exact wording to see if that applies to private property. In Saskatoon at least it only applies to public property. Most areas around me are within town/village limits. No discharge from sign to sign. Outside the town signs are rural and discharge is allowed. I use duct seal in a home-made wooden frame... 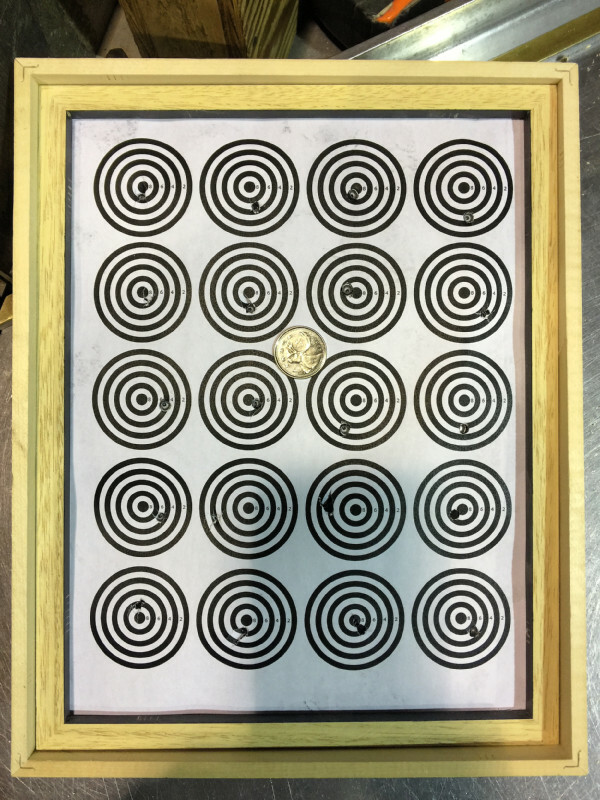 I print my own targets on letter-size (8.5" x 11") paper and the opening size of my wooden box is 9" x 11.5". It took 8.5 "bricks" of that duct seal (at $2.99 each) to fill, and I made a friction-fit frame that fits into the opening of the box to hold the paper target down in place. I shoot in my back warehouse after work and the area behind where I place the target is perfectly safe even if I miss the target completely. But at 10 and 20 meters, I'm not missing it. I bought my duct seal at Home Depot and it's a dark grey material. Worked perfectly. So well in fact that I made a second box so that I could set up two of these so that two shooters could shoot side-by-side at the same time. Only problem was that I'd cleaned out the entire stock at the local Home Depot for my first box. So I went to Reno Depot and bought a "similar" duct seal there. It was $3.19 per brick (about the same size). It was much lighter in color. Anyway, the material was not the same and it was WAY too sticky!!!! So sticky in fact that my paper targets would get completely stuck to the duct seal and would be difficult to remove without tearing and without making a mess on the back of the target. And the stuff was much lighter in weight (meaning less dense?) as well. So being unhappy with the second box, I drove out of my way to ANOTHER Home Depot and bought some of the "good stuff". Replaced the crappy Reno Depot stuff and now I've got two of my target pellet traps that work perfectly. Even with an 800 fps rifle at 10 and 20 meters distance, the pellet doesn't fully embed in the duct seal and is very easy to flick out (which is what I do after shooting). The sound of the pellet hitting the duct seal is VERY quiet and there are no ricochets. I'm really pleased with this. I have checked and double checked. Even Crown Lands near and around Greater Vancouver are No-Shoot Areas. It is a question of politicians doing their darndest to save us from ourselves. What is frustrating is the CFP or lawmakers bunching airguns with firearms.